This classic and easy recipe is a must have for anyone making good food at home. I make this dressing at least once a week. The key to this recipe is quality ingredients, so don’t use the cheap stuff! Place all ingredients except oil in a small bowl or large measuring glass. Slowly drizzle olive oil in with remaining ingredients while whisking furiously. 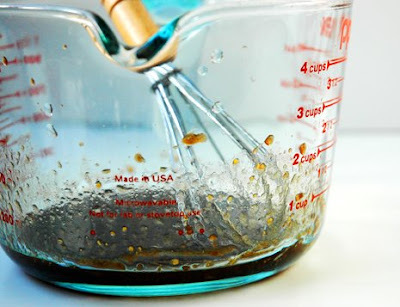 Whisk until all ingredients combine and mixture emulsifies. Looks fantastic. 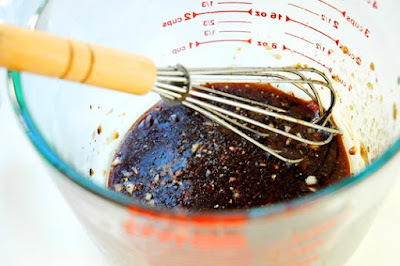 Love, love, love balsamic dressing like this. Well done! Mmm I just learned the dijon mustard trick the other day and I love it! Have never added garlic though I can’t wait to try it. I will have to try this. I love balsamic but never have tried with the dijon. Great idea! Thanks everyone! This is a super easy dressing to make and it’s so delicious! I make a balsamic vinaigrette about once a week, using these same ingredients, but I have never used equal parts oil and vinegar and I’m a little puzzled by it. Mine is about 3 parts olive oil to 1 part balsamic and it’s very tart and flavorful. You must use a very small amount of this to dress your salad? I tend to like my vinaigrette’s on the tart side and find that 3 parts oil to 1 part vinegar is just too oily for my palette. Also, I like my salads lightly dressed, so yes, I only use small amounts. Thanks for the comment! I just made this and wanted to let you know it rocked! thanks for the recipe!